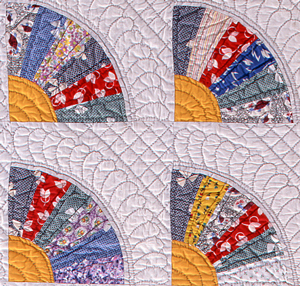 Grandmother's Fan quilt was used to be called as Fan quilt block quilt. 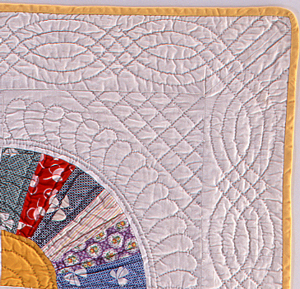 In this quilt, feather stitch embroideries were worked above each fan. It helps to create a luxurious fan as Grandmother's Fan usually consists of only pieces. Note that some of the pieces used in fans are look just like the white fabric on the base, and they set off this quilt even more. Grandmother's Fans quilt pattern was especially beloved by Indiana Amish. Copyright © 2010 Eco Inc. All rights reserved.